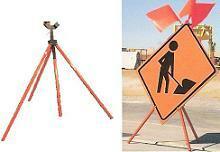 T-155 Heavy Duty Tripod Sign Stand with three highly visible, pivoting Orange legs and adjustable mast that accommodates 36- or 48-inch roll-up or aluminum signs. Comes with triple flag-holder. Folds up for compact storage, 18 lbs. NOTE: Must add RUB100 Roll-up Bracket to use this sign stand for roll-up signs.